(Nanowerk Spotlight) An important property of polyaniline (PANi), a polymer, is its electric conductivity. This makes it suitable for the manufacture of electrically conducting fibers. Consequently, PANi and other conductive polymers have been extensively studied for optical and electronic applications and many practical syntheses of one-dimensional (1D) nanostructured PANi have already been developed. However, preparation of water-soluble, conductive PANi nanowires with controllable morphologies and sizes, especially with good processibility, is still a big challenge. A possible solution could lie in the use of self-assembled proteins, such as plant viruses, as nanotemplates for the synthesis of these nanowires. For instance, genetically modified viruses have already been proposed as templates for the assembly of nanometer-scale components of electronic circuits (see for instance: "Phonon Confinement Effects in Hybrid Virus-Inorganic Nanotubes for Nanoelectronic Applications"). 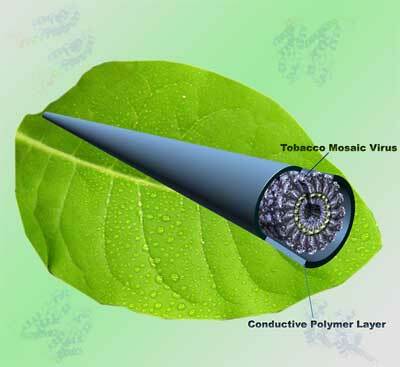 Researchers now have successfully demonstrated the fabrication of water-dispersible, conductive PANi nanowires using the rod-like tobacco mosaic virus (TMV) as a template. They have also shown that much longer conductive PANi/TMV nanowires (>300 nm, greater than the length of a native TMV particle) can be formed by a hierarchical assembly process. "TMV is a classical model of 1D self-assembled protein particles" Dr. Qian Wang explains to Nanowerk. "Our findings of using biological nanoparticles as the template to fabricate 1D nanowires is a new concept by taking advantage of structural features of a plant virus. So far, few studies have reported the use of intrinsic self-assembly properties of biological particles. The key concept behind our study of TMV templated polymeric nanowire is to take advantage of the self-assembly pathway of the TMV itself." The work of Wang, an Assistant Professor in the Department of Chemistry and Biochemistry, and his collaborators at the University of South Carolina, demonstrates that biogenic assemblies can be further assembled in a 1D manner which can be employed as template for the fabrication of water-dispersible, conductive polymeric nanowires. The findings have been published in the November 17, 2007 web edition of Nano Letters ("Biological Templated Synthesis of Water-Soluble Conductive Polymeric Nanowires"). Wang explains that the conductive polyaniline/TMV composite nanowires can be readily prepared by incubation of TMV, aniline, poly(sulfonated styrene) (PSS), and ammonium persulfate (APS) at room temperature. "We used highly negative-charged PSS both as the dopant acid to enhance the conductivity of PANi and to improve the stability of composite fibers in aqueous solution," he says. 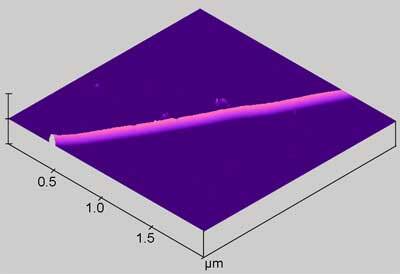 The researchers also performed scanning spreading resistance microscopy (SSRM) in conjunction with regular atomic force microscopy (contact mode) to obtain simultaneous electronic and morphological information about the nanofibers. Using SSRM they measured the electronic properties of the composite nanofiber and calculated a conductivity of ∼1 x 10-5 Ω-1cm-1. "This nanowire conductivity is not as high as those of semiconducting ones (few Ω-1cm-1) or carbon nanotubes (1-5 Ω-1cm-1), but compares well with PANi nanofibers synthesized by other methods, and would nonetheless permit useful applications in low-power electronic and sensor devices" says Wang. Using biological particles as scaffolds for chemistry and materials development is an emerging research field and what this research shows is that – using bionanoparticle building blocks – water soluble and nearly monodisperse nanowires can be synthesized which can not be obtained by traditional synthetic methods. The resulting composite fibrillar materials are characterized by narrow dispersity, high aspect ratio, and high processibility, which can have many potential applications in electronics, optics, sensing, and biomedical engineering. Wang hopes that this research will lead to fabrication methods for new nanodevices using biological templates/materials, and to a controllable process of assembling bionanoparticles in 3D matrices. "The greatest challenge that we are faced with today, with regard to the application of biological materials to nanotechnology fabrication, is how to enhance the mechanical strength" says Wang.